We love a reasonably priced cocktail, but we also prefer to enjoy our post-work hours sans rowdy college kids. Here are seven classy Miami happy hours for the grown woman you are—because being a grown-up means drinking $6 frosé, right? 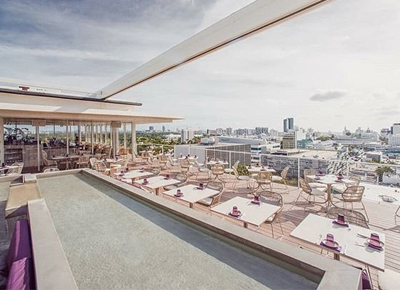 If you’re in Brickell and want an elevated cocktail menu in an upscale setting, you’ve found it. This darling den inside the Four Seasons has happy hour every night. Expect two-for-one small plates, $1 oysters and half-priced beers, wines and cocktails from 4 to 7 p.m. Sometimes to escape the madding crowd, you have to take it to the skies. Whisk yourself away to the 16th floor of the Epic Hotel and behold the posh setup at Area 31. Snack on $7 bites and drinks every Monday through Thursday from 5 to 8 p.m., or stop by on Friday for beat-the-clock specials ($5 drinks at 5 p.m., $6 at 6 p.m. and so on) with a live DJ. Is it the cozy patio, the ridiculously cheap happy hour ($4 dips and $8 spiked slushies) or the French-onion pizza that makes us love this place so much? We don’t know and, frankly, we don’t care. You can catch us here Wednesday through Sunday from 5 to 7 p.m. Weekdays from 5 to 7 p.m., you can get $6 wines by the glass, $5 beers and $7 select cocktails, along with a range of small plates, sliders and snacks for less than $9 inside this beachy Key West—inspired eatery in Sunset Harbour. Daniel Boulud’s gorgeous Boulud Sud is worth a visit anytime—but especially during happy hour. Monday through Friday from 5 to 8 p.m., indulge in $6 frosé, $8 wines and $5 bites. Weekdays from 4 to 7 p.m. (and again from 11 p.m. till close! ), feast on small snacks, raw bar items and sushi rolls for $3 to $12, with pitchers of beer or sangria for $25. American Wagyu sliders with quail eggs, anyone?